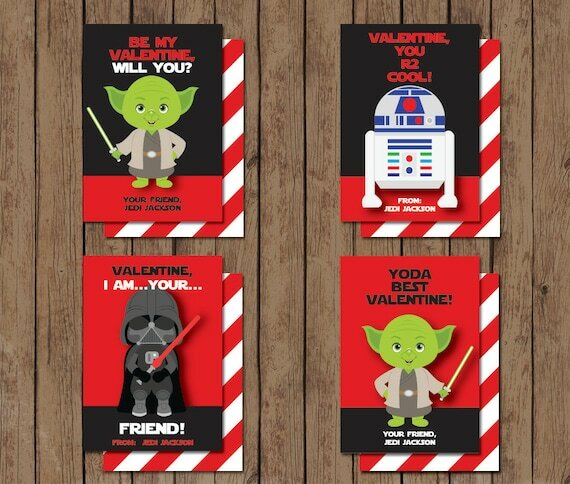 Star Wars Valentine Card Printables featuring Yoda, Darth Vader & R2D2. Includes 4 designs plus 2 optional backside designs. Backs are formatted on a standard 8.5 x 11 inch page making it super easy to print with front side. Files of 4 designs (plus 2 optional backside designs) set up for easy printing & cutting! Simply print at home or send to your preferred print shop. Four designs are listed on a standard 8.5x11 inch page (8 cards per page). After adding item to cart, please let us know your child's name as you wish for it to appear on card in the "Notes to Seller" section. Within 2 business days of your purchase, your personalized files will be e-mailed to you at the address you have set up with Etsy for you to save, print and cut!